A BREXIT DEAL can be reached this month, according to Tánaiste Simon Coveney. Speaking to reporters at Iveagh House this evening following a meeting of the British-Irish Intergovernmental Conference today, Coveney said significant progress has been made in recent weeks, adding that the withdrawal agreement is “nearly done”. Coveney and Britain’s Cabinet Office Minister David Lidington said they “hoped and expected” that Brexit negotiators would secure a final agreement in the coming weeks, adding that both sides are very close with getting it over the line. The Tánaiste said a number of things are still required, stating that negotiators on both sides still have no basis as of yet to indicate political sign off if an EU summit is called. “I don’t think we are quite there yet,” he said, stating that some movement by the British side to find a legal wording is needed. He said it is no coincidence that he has been meeting with UK politicians in recent days such as British Brexit Secretary Dominic Raab, stating they are working on the same issue as to how to assure that commitments previously made to Ireland and the EU are now followed through on by Britain. 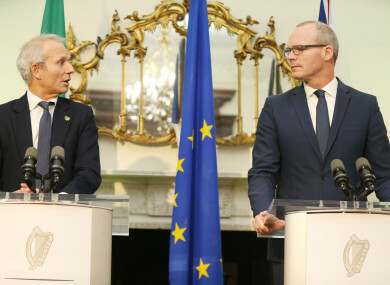 Lidington said the talks have been “intensive” in recent weeks, adding that he wanted to leave no doubt in the minds of the Irish people that the UK Prime Minister Theresa May and her government are committed to the undertakings they have given. He said the negotiations cannot be allowed to “drift” to the 29 March stating that both the EU and the British parliament have get any such deal passed and legislation must be drafted to give effect to any withdrawal agreement. The MP was keen to state that the ties between Ireland and the UK will remain strong post-Brexit. At today’s meeting, it was agreed “top level summits” alternating between Ireland and Britain each year would be held between the two government, and these would be backed-up by close bilateral work between ministers. Lidington said such meetings would be “vital” to maintain the close links between the two countries, due to ministers and leaders not being able to meet regularly at EU summits, as is typically the case. Email “Brexit negotiators are 'very close' to resolving differences over Ireland’s border”. Feedback on “Brexit negotiators are 'very close' to resolving differences over Ireland’s border”.